When someone says “cactus,” most of us automatically picture the stately saguaro with its distinctive, majestic “arms” stretching skyward. What most people don’t know about the saguaro, pronounced sa-wah-roe, is that it takes a human lifetime for one of them to mature. These magnificent cacti may live to be over 200 years old. Once you’ve successfully sprouted your saguaro, be very patient. It will take a year to grow 1 inch tall, 10 years to reach the nosebleed height of 6 inches, 40 years to flower, and 75 years to begin growing arms. So, be sure to take the steps to make arrangements for it in your will. 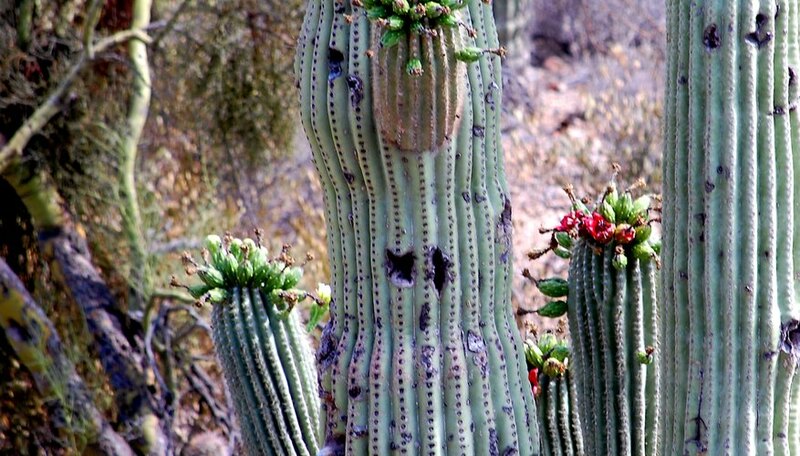 Purchase saguaro seeds, but don’t attempt to collect any from a wild Sonora Desert plant. Don’t try digging up a youngster, either. It’s illegal to touch a wild native saguaro. Seeds are actually more accessible than one might think, however, considering how protected the species is. They are available from plant nurseries that legally grow saguaros specifically for retail seed production. Fill a 4-inch clay pot three-quarters of the way full with a mix of 3 parts potting soil and 1 part coarse sand. Clay pots are best for most cacti because they “breathe” and allow for excellent drainage. Cover with a 1/4-inch layer of pea gravel. Place four seeds on top of the gravel, evenly spaced about 1 inch apart. Spritz the medium with just enough distilled water to moisten it lightly, but don’t wet it to the point of being soggy. Distilled water is best because it contains none of the impurities present in tap water. Cover the pot tightly with plastic wrap or seal it in a clear plastic bag, which will retain moisture in the miniature greenhouse. Place it in a warm spot where it will receive plenty of bright indirect light. The top of your refrigerator is a good choice. Spritz the medium surface with distilled water once every 10 days if the medium below the gravel is dry. Continue to keep covered with plastic for at least 4 to 6 weeks, or until the first set of true leaves appears. Remove the plastic wrap permanently and spritz lightly to water the seedlings about every 10 to14 days, or when the medium under the gravel feels dry. Provide plenty of bright indirect light, but keep them out of direct sun and keep them warm. Temperatures below 40 degrees F will probably kill them. Keep the babies in their nursery pot until they are 1 inch tall, in 1 to 2 years. They can then each be moved to their own individual pots.